Signing off on any new website is always a moment of enormous pride and satisfaction for us. And, as our list of clients grows, the work we undertake for them will be proudly featured on this page. 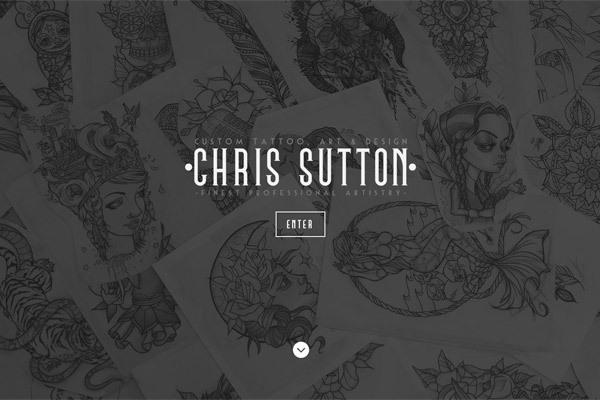 Award-winning illustrator and resident tattoo artist, Chris Sutton, commissioned us to build his new portfolio website for his tattoo work. Opting for a monochromatic, minimalist design to match his branding, Chris was over the moon with the slick and functional website we’d designed to showcase his extensive talents. 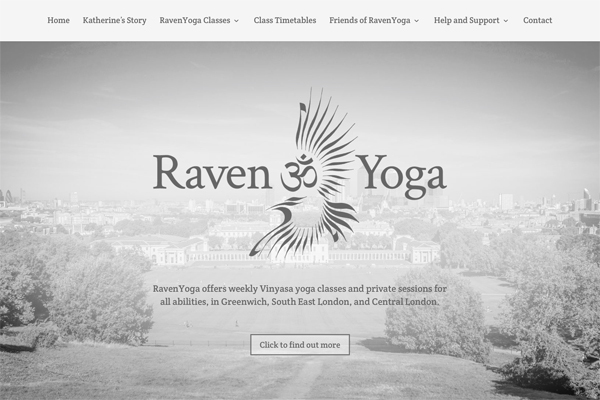 Katherine Cox of RavenYoga commissioned us to completely redesign and build a brand new website for her growing, Greenwich-based vinyasa yoga business. We worked closely with Katherine to develop a design which accurately reflected her ethos regarding what she does; opting for a colour palette of soothing monochrome shades, complimented by a balanced meld of fonts and black and white photography. Katherine also commissioned us to redesign her business cards, to mirror the personality of her new website. Croydon-based yoga teacher Chris Abay and his partner Sarah, chose Nice as Pi to construct their new website for their brand new yoga business – abaYoga. Already offering classes throughout the South Croydon area and expanding rapidly, Chris and Sarah needed a provider that could grow their online presence with them, as their business grew. 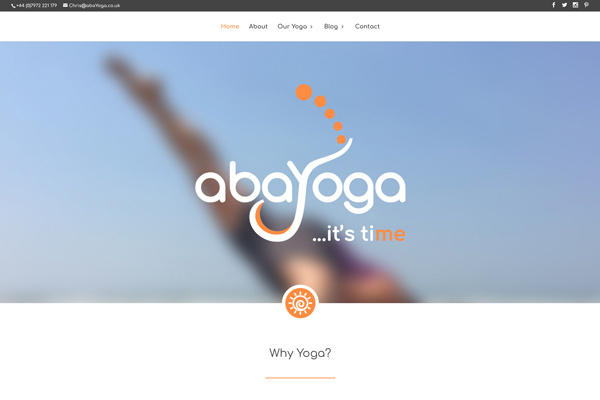 The new abaYoga website includes an integrated booking system. This system enables customers to book classes in advance, allows Chris and Sarah to manage their own bookings, and provides Chris and Sarah with all-important class reports; keeping them up to date with how their business is performing. Nathalie Joel-Smith, a yoga teacher and performer based in St Margrets, West London, commissioned us to design and build a new home for her rebranded, multifaceted business. Currently, Nathalie’s website consists of a single page featuring her upcoming yogic retreats. The rest of her website is sitting in the background, hidden from public view, awaiting development as Nathalie’s business evolves. Keep checking back for updates regarding Nathalie’s website, because once it’s all live – it’s going to be great! 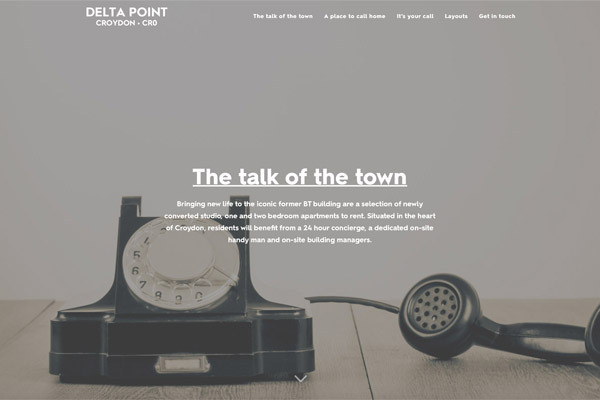 Acorn, South East London’s leading independent estate agency firm, approached us in 2018 with a brief for a one-page layout to showcase the upcoming Delta Point development in Croydon. Acorn had already put together a mockup for the site, which we not only followed, but improved upon (with Acorn’s go-ahead, of course). We worked closely with Acorn’s IT department to achieve a result consistent with the branding of both the agency and the developer, whilst never losing sight of the basics of solid, aesthetically pleasing website design and functionality. 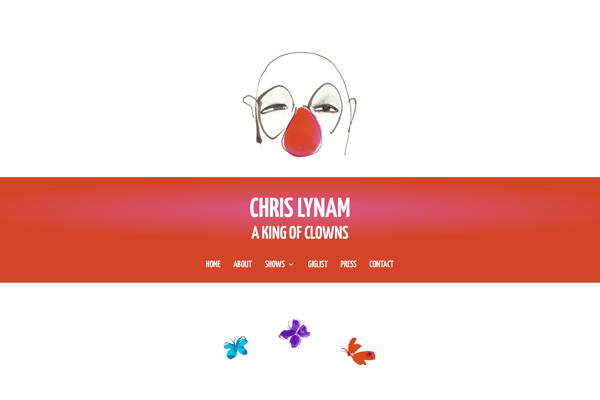 Performance stage artist Chris Lynam has been a regular on London’s comedy circuit for many years. He’s been described as “our most dangerous comic”, “the most dangerously funny man on the planet”, and “a brilliantly bizarre antidote to modern society” by everyone from The New York Times to Eddie Izzard. Chris needed a single website to replace his existing three, and he needed it to work seamlessly on any and all web browsing devices. For Chris, we streamlined and simplified his site structure, and came up with an entirely new design that allowed for his content to be easy to find and easy to digest, and showcased his talents in a modern and compelling way. 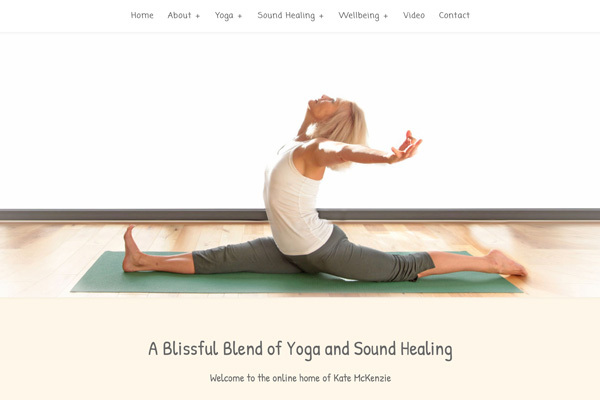 London-based yoga teacher and Sound Healer, Kate McKenzie, needed a fresh, new website design to coincide with the 2017 launch of her online course, Living Your Heartsong. Kate wanted her website to accurately reflect the warm energy she communicates through her yoga and wellbeing practices. Kate’s site uses softened lines and a gentle transitioning of colours, working together to complement a fully featured website incorporating newsletter sign-up and online course subscription forms, and embedded video and SoundCloud integration, in an intuitive and accessible way. 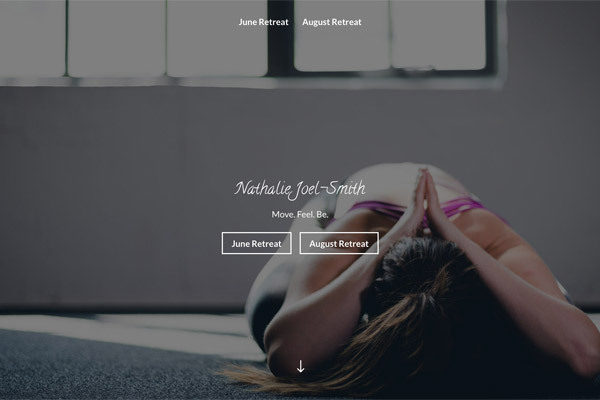 Central London-based Hatha Yoga teacher, Kirstie (Kay) Wettasinghe, approached us with a plan to build a brand new website for her growing business. Offering public classes and private sessions, Kay needed a flexible website structure that could easily scale up and evolve as her business developed. For Kay, we developed a design with this ethos in mind; a concise, easy to navigate website that puts even the most anxious web user at ease when navigating what will, in time, be an expansive site showcasing many different products and services.